The makers of Natrol Menopause Formula is very familiar with the physical and emotional symptoms of menopause such as hot flashes, difficulty in sleeping and having not enough energy to go about their day. Black Cohosh – helps manage hot flashes, night sweats and headaches. Soy Isoflavones – helps increase estrogen levels. Red Raspberry Extract – Helps relax blood vessels to help with mood swings and difficulty sleeping. Red Clover Extract – helps with vaginal dryness. Dong Quai – helps balance estrogen levels in early stages of menopause. Wild Mexican Yam Extract – helps aid cramps and headaches. Calcium, Magnesium, Licorice Extract, Horse Chestnut Extract, Damiana Extract, Chaste Tree, Gingko Extract, Gotu Kola Extract, Gamma Oryzanol, Gelatin, Acacia, Silica, Water, Maltodextrin and Magnesium Stearate. The capsules should be taken 3 times a day. However, there are only 20 capsules in a bottle which means that you will have to buy several bottles to last you a month. Natrol Menopause Formula is sold for $14.89 and is suggested to be taken with Melatonin Fast Dissolve which is a night time sleeping aid that promotes relaxation. However, this product is not clear about any money back guarantee. While Natrol Menopause Formula might be a great product, there are several things that a customer should keep in mind before purchasing. Some ingredients may give you more problems in the future such as Gamma Oryzanol. Gamma Oryzanol is used in cosmetic surgery and may have applications in duyslipidemia and cancer. Also, there are only 20 capsules in a bottle, so you will have to buy several bottles to see any effect take place. The choice is yours when choosing your next menopause treatment option. 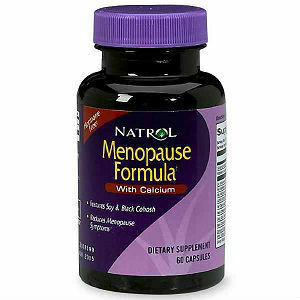 Jackie Horowitz	reviewed Natrol Menopause Formula	on April 24th	 and gave it a rating of 2.